NMTC is a national-level mathematics contest conducted by the Association of Mathematics Teachers of India (AMTI). The aim of the Tests: To discover and encourage students who have the capacity for original and creative thinking, readiness to attack unfamiliar and non-routine problems exhibiting a general mathematical ability appropriate to their level. It will consist of objective type questions in multiple-choice types and fill in the blanks, each 50% of the total. Preliminary test will be conducted by the institutions/schools the top 10% scorers at each level in the Preliminary Test will be qualified for the second stage. For such selected candidates, certificates alone will be sent as a Hall Ticket for the final examination. It will consist of essay type questions. It will be conducted in chosen centres in the respective states and the students appearing for the final tests shall write the test only in the centres allotted by the AMTI. Cash Awards to the top 3 winners in each level at the finals, (1st position Rs.5000/-, 2nd Rs.2500/- and 3rd Rs.1250/-), Merit Certificates for them and others selected at the final level with some cash award for the latter also will be given based on their revealing a reasonable level of mathematical maturity. 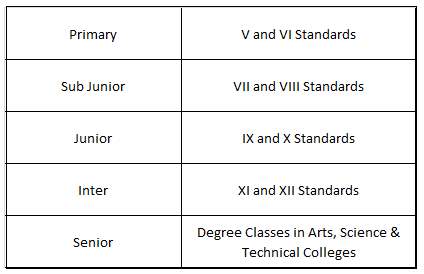 Enrichment contact courses are likely to be organized for the promising toppers. "NMTC (National Mathematics Talent Contest) is organized by AMTI To discover and encourage students who have the capacity for original and creative thinking, readiness to attack unfamiliar and non-routine problems exhibiting a general mathematical ability appropriate to their level"